All Web addresses mentioned were functional as of 12-11-15. From the Cumberland Gap to the Atlantic Ocean, this is Virginia Water Radio for the week of December 14, 2015. This week, the sound of Mallard ducks on a December day in Blacksburg, Va., is the call to explore the annual Christmas Bird Count, organized by the National Audubon Society. Since 1900, the Society has helped organize volunteers to hold local daylong bird counts between December 14 and January 5. On any single day within that period, volunteer counters follow specific routes within 15-mile diameter circles, counting every bird they see or hear. The count provides a snapshot both of the species encountered and of the numbers of individuals within each species. According to the Society, this effort is the “longest running citizen-science bird project” in the United States. The results of such a long-term inventory help show the status of bird populations and the impacts of changes in habitat, climate, and other environmental conditions. Of course, birds living around water and wetlands are part of the annual count; in fact, the Audubon Society’s founding in the late 1800s was due largely to concerns over commercial use of plumes from egrets and other wading birds. So what kinds of water-related birds might Virginia Christmas bird counters find? Have a listen for about 20 seconds to this sample, and see how many you know. The Bald Eagle, Belted Kingfisher, and Canvasback duck are among dozens of water-related birds that inhabit parts of Virginia during winter. Keeping track of these and other feathered Virginia winter residents is a holiday tradition for many Commonwealth citizens with patience, binoculars, and attentive ears. Thanks to Lang Elliott for permission to use the eagle, kingfisher, and canvasback sounds, from the Stokes Field Guide to Bird Songs. And we close with one more from Mr. Elliott: the wail of a Common Loon, which some lucky Christmas bird counter in Virginia might hear on a December night. The sounds of Bald Eagle, Belted Kingfisher, Canvasback, and Common Loon were taken from the Stokes Field Guide to Bird Songs-Eastern Region CD set, by Lang Elliott with Donald and Lillian Stokes (Time Warner Audio Books, copyright 1997), used with permission of Lang Elliott, whose work is available online at http://www.langelliott.com/ and the “Music of Nature” Web site, http://www.musicofnature.org/. Mallards (several males, plus one female on right) on Virginia Tech Duck Pond, Blacksburg, Dec. 10, 2015. Great Blue Heron in Virginia Tech stormwater pond, Blacksburg, Dec. 11, 2015. 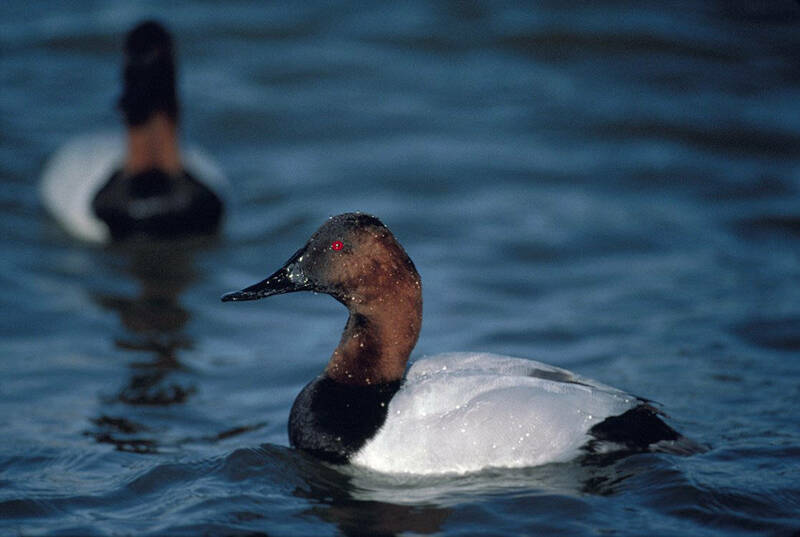 Male Canvasback in Maryland. Photograph by Eugene Hester, made available for public use by the U.S. Fish and Wildlife Service’s National Digital Library, online at http://digitalmedia.fws.gov/cdm/singleitem/collection/natdiglib/id/2980/rec/3. Another nationwide count, the Great Backyard Bird Count, organized by Audubon and the Cornell University Ornithology Lab, is held each February. This count allows participants to follow a less strict protocol than the Christmas Bird Count (volunteers can observe for as little as 15 minutes), but its results also contribute to large-scale and long-term understanding of bird species distribution and health. For more information, visit http://gbbc.birdcount.org/. “Outrage over the slaughter of millions of waterbirds, particularly egrets and other waders, for the millinery trade led to the foundation, by Harriet Hemenway and Mina Hall, of the Massachusetts Audubon Society in 1896. By 1898, state-level Audubon Societies had been established in Pennsylvania, New York, New Hampshire, Illinois, Maine, Wisconsin, New Jersey, Rhode Island, Connecticut, the District of Columbia, Ohio, Indiana, Tennessee, Minnesota, Texas, and California. ...In 1901, state-level Audubon groups joined together in a loose national organization.... In 1905, the National Audubon Society was founded, with the protection of gulls, terns, egrets, herons, and other waterbirds high on its conservation priority list.” – National Audubon Society, “History of Audubon and Science-based Bird Conservation, online at http://www.audubon.org/content/history-audubon-and-waterbird-conservation. “Generally loons are silent on the wintering grounds, but occasionally on a quiet winter night one will hear their primeval, tremulous yodel.” – Alice Jane Lippson and Robert L. Lippson, Life in the Chesapeake Bay (Johns Hopkins University Press, Baltimore, Md., 2006), p. 285. “All calls can be heard in migration and winter, but compared to the breeding season, they are uncommon.” – Cornell University Lab of Ornithology and American Ornithologists’ Union, “Birds of North America Online/Common Loon/Sounds,” online at http://bna.birds.cornell.edu/bna/species/313/articles/sounds (subscription required for this site). Cornell University Lab of Ornithology and American Ornithologists’ Union, “Birds of North America Online,” online at http://bna.birds.cornell.edu/bna (subscription required for this site). National Audubon Society main Web site, online at http://www.audubon.org/. National Audubon Society, “Christmas Bird Count,” online at http://www.audubon.org/conservation/science/christmas-bird-count. Kathy Reshetiloff, “Chesapeake’s winter visitors include a couple of loons,” Bay Journal, 12/8/14, online at http://www.bayjournal.com/article/chesapeakes_winter_visitors_include_a_couple_of_loons. For an episode on winter birds, particularly, please see Episode 150 (2-25-13), Winter Birds of the Chesapeake Bay. For an episode on the role of egrets and herons in the history of the Audubon Society and other conservation organizations, please see Episode 277 (8-10-15), Two Great Birds.